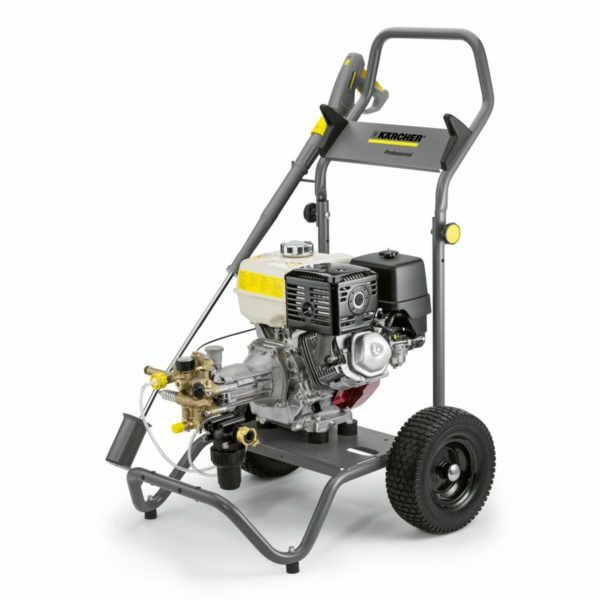 This mobile, Cold Water High-Pressure Cleaner has a powerful Diesel engine and is designed to meet the many cleaning requirements of professional users. Powered by a 4 stroke 10.0 HP Yanmar engine with electric starter, the HD 9/23 DE is built on a powder-coated, corrosion resistant sturdy steel frame with rubber-tyred wheels for maximum stability and low vibrations. This is perfect for tough daily applications in places where no power outlet is available and suitable for painters, plasterers, facade cleaners, building contractors, farmers and the forestry industry and local governments. The cage completely protects all components of the machine and the frame is also designed to make it suitable for mechanical handling by a crane. Other features include the low oil cut-out facility, which shuts down the engine automatically if the oil level is too low. It also has an automatic speed reduction facility where the engine speed can be reduced during work breaks to keep noise level low.